SCVHistory.com HS1802 | Heritage Junction | New Signage for Saugus Train Station, September 2018. September 2018 — Visitors to Old Town Newhall will know they've arrived in Saugus, now that the signage has been restored to the Saugus Train Station in William S. Hart Park. Two veteran railroaders, Mike Jarel of Valencia and Larry Jennings of Fillmore, are responsible for the signs, which can be seen on the front of the station (facing Newhall Avenue) and at its two ends. Jarel fabricated and Jennings painted the signs, which they donated to the Santa Clarita Valley Historical Society on September 24, 2018, and subsequently mounted. The Historical Society saved the historic 1887 Southern Pacific depot from the wrecking ball in 1980, moving it from its original location at Drayton Street and (now) Railroad Avenue in Saugus to Hart Park in Newhall. The depot became the Historical Society's headquarters and museum and the anchor of Heritage Junction Historic Park, where additional rescued buildings joined it. Santa Clarita Valley residents of the 1960s and 1970s might remember signs on the depot that simply read, "Saugus." But up to the 1950s, the signs also showed the distance to San Francisco and New Orleans. That is what the new signs show. SPRR Saugus Depot with original sign in 1914. Click to enlarge. "The mileage figures on the signs traditionally show mileage from the station to the Southern Pacific headquarters city of San Francisco and to the opposite end of the particular route of the station, which in this case was New Orleans," Jarel said. If you ride the rails with a really long tape measure, you'll find the distance is off from Newhall. That's because the 451.7-mile distance to San Francisco is calculated from Saugus. "The mileage figures, along with the elevation figures, are correct for where the station originally stood on the southeast corner of Drayton Street and Railroad Avenue," Jarel said. "The figures were verified by both company documents along with historic photographs of the depot showing the station signs." Jennings said the Southern Pacific Railroad established norms for signage in the late 1800s. "The SP wanted a consistent corporate identity system-wide," he said. "They came up with the SP Common Standard so no matter who or where work was done, it would be the same." "The size, shape and lettering placement for the Saugus depot sign is based on the SP Common Standard dated 1904. The lettering style is based on the SP Common Standard dated 1947," Jennings said. Jarel retired from a 40-year career with the Union Pacific Railroad in July; he actually started with the Southern Pacific in 1978 when the Saugus depot was still active. The two lines merged in 1992. He said he got the idea for restoring the signage soon after moving to the SCV in 1997 and volunteering on various depot-related projects for the Historical Society. "Early on with my involvement with the depot, I had noticed the station signs were missing, although the mounting brackets survived on the roof. I had always felt the station building was incomplete without its station signs, an identifying feature of any railroad depot," Jarel said. "After much research of SP common standards for its station signs, proper sign boards were cut, primed and painted in preparation for lettering." Jarel said there were "several false starts" with qualified sign painters until Larry Jennings "stepped forward and volunteered to donate his lettering expertise." Jennings, who has repaired, restored and painted a lot of rolling stock in his decades with the Pacific Railroad Society, has been around trains all his life. Born in South Gate, he said he "crossed the Southern Pacific Santa Ana branch tracks every day on the way to school, from kindergarten through high school. The bleachers for the high school football stadium overlooked the tracks. The best part of a football game was if a train would go by." The Southern Pacific became Larry's favorite railroad — so much so that his house in Fillmore, built in 1915, is painted Southern Pacific depot colonial yellow with brown trim, "just like the Saugus depot," he said. Today, when he's not repairing or painting trains, Jennings is driving them. He is a locomotive engineer on the Fillmore & Western Railway. The Saugus train station opened Sept. 1, 1887, when the Southern Pacific Railroad completed the spur line to Ventura along the present-day alignment of Magic Mountain Parkway to State Route 126 through Castaic Junction, Camulos, Piru, Fillmore, Santa Paula and Saticoy — where the SP also erected depots or sidings of various size. The large, two-story Saugus depot followed a standard set of SP blueprints and stood at the southeast corner of present-day Drayton Street and Railroad Avenue (previously San Fernando Road). 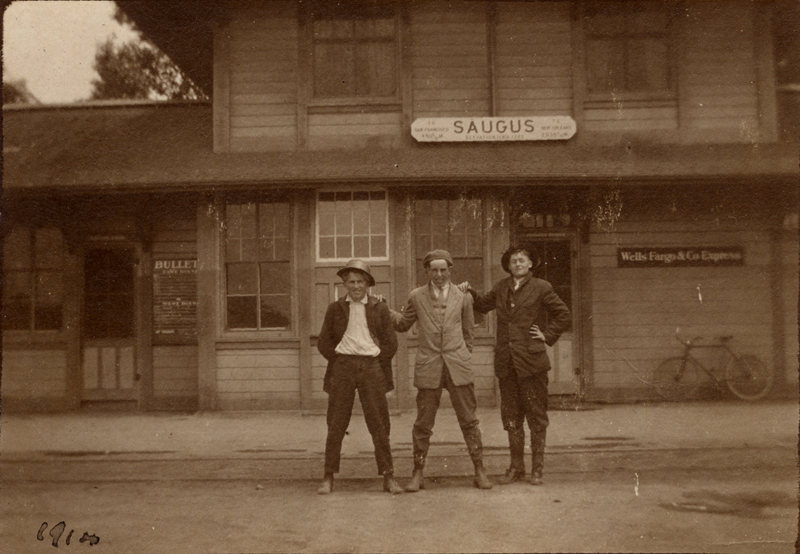 Tolfree's Saugus Eating House occupied the north side of the depot until 1905 when it moved across the street into its own building and became the Saugus Café. President Benjamin Harrison stopped over in April 1891, and Theodore Roosevelt was met at the depot by California governor and Acton gold mine owner Henry T. Gage in 1903. Twenty years later, Charlie Chaplin used the depot in "The Pilgrim," and in 1954 another U.S. president was scheduled to stop at the depot but the feds caught wind of an assassination attempt in time. Of course, this last one was Hollywood fiction; the movie was "Suddenly" and the assassin was played by Frank Sinatra. It was filmed entirely in Saugus and Newhall. Passenger service ended in April 1971 and the last station agent, James "Bob" Guthrie, shuttered the depot for good on Nov. 15, 1978. Facing demolition by the SP, the depot was rescued in 1980 through a fundraising effort organized by the Santa Clarita Valley Historical Society, then just 4½ years old. During the night of June 24-25, 1980, it was moved two miles south to the society's home at Heritage Junction at William S. Hart County Park in Newhall, where its film career continued (e.g., "The Grifters" with John Cusack and Angelica Huston, 1989). Today the depot is an educational venue for visiting elementary school students and patrons of the SCV Historical Society's lectures and film showings, as well as the home to the society's offices, collections, meetings, and the community's "temporary" history museum while the Pardee House at Heritage Junction is turned into a permanent museum facility. HS1802: Download larger images here.